Mantra Yantra :- Mantras are considered to be divine rhymes composed by the ancient Vedic Rishis/saints in the divine language of Sanskrit. 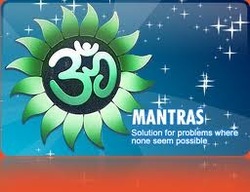 Mantras are energy-based sounds. They are primarily used as spiritual conduits, words or vibrations that instill one-pointed concentration in the devotee. Other purposes have included religious ceremonies to accumulate wealth, avoid danger, or eliminate enemies etc. Initiation – If possible, before attempting Japa one should seek out a guru and receive mantra initiation from him. Only those who are themselves pure can give initiation to others. Therefore it is important to find a qualified guru to successfully implant the mantras in the disciples body. If no guru can be found, one may select any mantra that seems appropriate to fulfil his desires, assuming Lord Shiva as his guru and start repeating it with mentally with faith and devotion everyday. The efficiency of the japa is accentuated according to the degree of concentration. The mind should be fixed on the source or the related YANTRA. Then only you will realize the maximum benefit of a mantra. Gayatri Mantra is the supreme mantra of the vedas. Gayatri is the mother of universe, the shakti itself. There is nothing she cannot do. Her mantra purifies the mind, destroys pain, sin and ignorance, brings liberation, and bestows health, beauty, strength, vitality, power intelligence and magnetic aura. Modern system of treatment is bereft of religion. Anybody who enchants the gayatri mantra everyday can never be affected by diseases. Mahatma Gandhi believed that It protects both your body as well as soul. The mantra of elephant headed God. A remover of obstacles and bestower of success. It is the mantra adopted by famous astrologer Bejan Daruwala. It is the mantra of Lord Shiva. Many people have become multi-millioner from penniless by enchanting this mantra. Lord Shiva is very innocent God and bestows his blessings immediately on the devotee. The mantra of Lord Vishnu. Any thing in the world is possible by worshipping lord Vishnu, who sustains the life in world. Enchanting this mantra saves you from many types of troubles. It bestows the devotee with prosperity, peace, wealth etc. The description of word RAMA is unlimited. Lord Rama is the incarnation of Vishnu. The influence of Rama is spread all over Asia in one or the other way. One can gain a lot in all fields of his life by enchanting this mantra. Godess Saraswati bestows the devotee with the memory, Knowledge and the power of speech. The mantra of lord Krishna, the incarnation of Lord Vishnu. Solves all the problems of devotee and bestows him with wealth and prosperity.